You will find Aage Hempel in ports around Spain, Gibraltar, Morocco, Portugal, Malta, Panama and The Netherlands. Our service activities are coordinated from the head office in Algeciras. Always contact our head office directly when you need service in any port both in Spain and out of Spain. 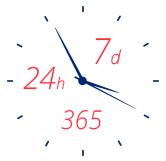 24 hours 365 days a year for national and international services. Aage Hempel Crame has 24 hour coverage for service and customers care whether it is night or day, just drop us a line or call us. Service is our main product. Calle de L'Oller, 37. Poligono "Parque Táctica".